Perfect day! the new steep drop off at Cabrillo Bay made the water super smooth was a quickly receding low tide. Looking forward to a great season! 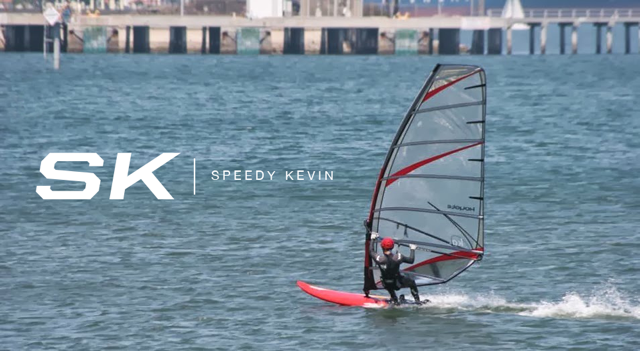 What Would You Do to Get Into Windsurfing? Was browsing around on Facebook and found this article about Abderazak Labdi. 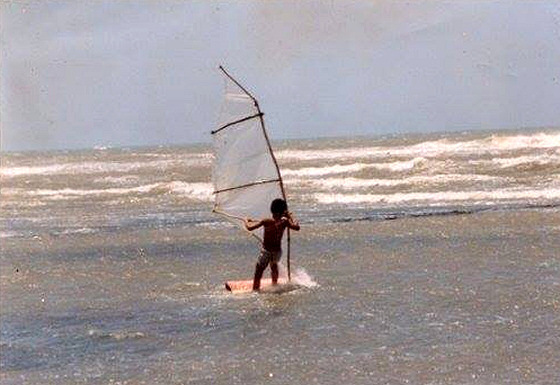 Long story short, Abderazak always wanted to get into windsurfing when he was younger but couldn't afford his own gear. SO instead he decided to make his own out of wood and some plastic! I must say I'm impressed! I've tried to find more photos of his equipment but to no luck. If anyone has it, please share! After this photo was published in a magazine, he received a few big name sponsors like Ezzy! Also Jim has also started a blog with some nice reviews. Check it out! I should be getting my Hot Rod 27/29 fins this Friday and hopefully be able to use them on the weekend. Will write my first impressions when I do! I was talking earlier with speed guru, Boris Vujasinovic, about possible speed sailing locations in California and several locations came to mind. One of the best days at Cabrillo. Not a clearing wind day either! For now we're stuck with potential 20+mph days instead. With a low tide, those days can still present a pretty flat 250m course before the death chop area. This place has sirens when the wind goes up to 35+mph. Only problem is the rangers close the reservoir to sailing when it reaches 40+mph. From what I've read, speedsailing events used to occur here so I'm sure we can encourage the rangers to let us sailors go at it when it nukes. Also from what I've been told, the water is freezing! Looks like a daunting place to sail. From what I've been told, this place was MIRROR flat. If you haven't heard of the ponds, it is located south east of where the 111 and 10 highway meet. Anytime I ever drove by that place the gusts were always trying to flip over my car... I would say at least 45-50+mph gusts. Sadly, I wasn't into windsurfing was this place "allowed" windsurfing but those who sailed it back in the 80s rave about this location. As one sailor put, "This place is the mecca of windsurfing!". Well for now I'll just have to stick with my home sailing spot and hope for some 20-25mph days!